Island Ecology Program, 2011 – present. 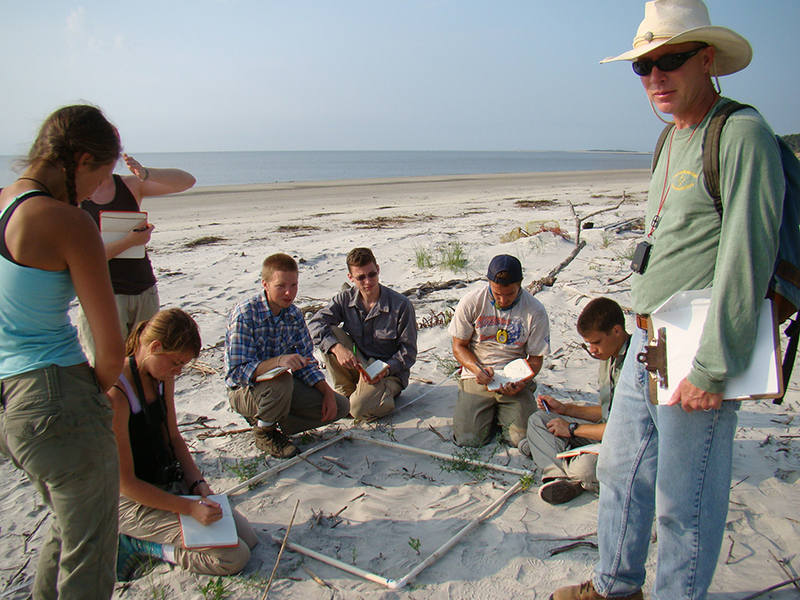 Co-direct Sewanee’s Island Ecology Program on St. Catherines Island off the coast of Georgia. 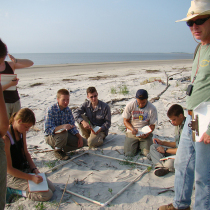 The program consists of a 14 week reading course followed by a 6 week intensive field course examining the geology, soils, land use, and plant, invertebrate, and wildlife populations on the island and surrounding marshes. Supervise budget development ($60,000), program expenditures, student recruitment and island logistics. Valles Caldera Trust, 2010 – present. White House appointment to serve on the nine member managerial board of the Valles Caldera National Preserve (New Mexico). The Valles Caldera Trust was designed to perform management and administrative services for the Preserve, establish and implement management policies, and to cooperate with federal, state, and local officials as well as the adjacent tribes and pueblos. Participated in annual budget review and approval ($5 million annual), public presentations of preserve actions and planned actions, reviewed management and strategic plans, interacted with public interest groups (environmental groups, cattle herders, tribal representatives, recreation groups) and key political figures. Prepared testimony for Senate subcommittee hearing. Attended quarterly meetings lasting 2-3 days, including . day public meetings. Resource Advisory Committee, Cherokee National Forest. 2010 – present. Secretary of Agriculture appointment to serve on the 15 member advisory board for the Cherokee N.F. The Secure Rural Schools Resource Advisory Committee (RAC) provides advice and recommendations to the Secretary of Agriculture through the Forest Service on the development and implementation of special projects on federal lands as authorized under the SRS Act. Attended multiple public meetings (6, . day meetings) with USFS representatives, county government officials, and local stakeholders to review and approve proposed projects. Forest Guild Board of Directors, 2010 – present. This board is the governing body of the Forest Guild. Headquartered in Santa Fe, New Mexico, the Guild is a national organization of more than 700 foresters, allied professionals, and supporters who manage forestlands in the United States and Canada and advocate for ecologically sound forest practices. The Guild maintains a presence nationwide with staff and volunteer coordinators in 12 states and nearly all major forest regions of the country. Reviewed and approved annual budgets ($1.2 million annual), made national programmatic decisions, and participated in national strategic planning sessions. University Forester, 2000 – 2006, 2009- present. Participate in the management team that is responsible for Sewanee’s 13,000 acre forest which is owned and managed by the University of the South. Current issues include forest restoration, housing development, recreational uses, wildlife management, and land acquisition and protection. Supervised timber contracts and forest harvesting operations (12 projects), conducted 20 prescribed burns, supervised collection and analysis of forest monitoring data (continual), worked with stakeholders to write two forest management plans (2003 and 2013). We are currently negotiating with several firms to develop a long-term carbon project under the California cap and trade program. Sewanee Utility District Board of Commissioners, 2006, 2009- present. Publicly elected seat on a five member board. The board assists the utility manager with the supervision and oversight of the utility district, which covers 40 square miles. The board deals with issues related to water treatment and distribution, the wastewater treatment facility (a 70 acre spray field that is managed for forest products), reservoir management, sewer and water line management, budget management (1 million dollar annual budget), and regional water planning. Attend monthly public meetings to discuss utility business and water issues. Chair-elect, Kentucky –Tennessee Society of American Foresters, 2014- present. Elected in 2013 and will serve as chair in 2015. Sit on the executive committee for the chapter which has close to 400 members across the two states. Director, New Mexico Forest and Watershed Restoration Institute, Las Vegas, New Mexico, 2007 – 2009. The NMFWRI, established by federal law in 2004, has an extension oriented mission to improve forest and watershed health across New Mexico. The NMFWRI collaborates with federal, state, tribal, and private land managers and assists stakeholders with post- and pre-treatment monitoring and inventory, prescriptions, mapping requests, and forestry-oriented short courses. Raised staffing levels from one full time staff to six permanent employees, five students (graduate and undergraduate), and ten contractors while operating on an annual budget of $900,000. Organized several statewide workshops, wrote proposals for project specific grants with federal and state agencies, organized annual work plans and financial reporting, and traveled extensively across the state to collect field data, give presentations at various venues, and develop projects with our partners. Chair, Environmental Studies Program, University of the South 2001-2006. Directed the expansion of the program from the concentration level (2-4 students per year) to 4 majors (45 students per year). Worked with the Development Office to fund summer internships and to establish an annual award for environmental service on campus. Developed the program web site and recruiting materials with Sewanee’s Admissions Department. Managed the annual budget and curricular changes, as well as program interaction with the Dean and off-campus entities. Courses taught included Island Ecology (EnSt 240), Forest and Watershed Restoration (FOR 262), Forest Soils (FOR/GEO 303), Forestry in the Developing World (FOR 212), Introduction to Forestry (FOR 121), Island Ecology (ENST 210), Natural Resource Issues and Policies (FOR 201), Soils and Cultivation (FORS 203), Introduction to Environmental Studies (ENST 200), Junior Presentations (FOR/GEO332), and Senior Seminar (FOR/GEO 432). I supervised approximately 25 student independent projects during this time period in subjects ranging from forest inventory and analysis to an assessment of campus utility costs and potential savings. Science and Education Coordination Committee for the National Ecological Observatory Network (NEON, Inc) Domain 7 region (includes Tennessee, Kentucky, and parts of Ohio and Virginia), 2009 – 2010. This committee is a means by which NEON, Inc. can provide status reports and research results to stakeholders that broadly represent the ecological science and education communities across the US. Chair, Southeastern TN Section of the Kentucky-Tennessee Chapter, Society of American Foresters, 2004-2006, 2011-2012. Organized bi-annual section meetings and triennial chapter meetings with SAF members. Forester, US Peace Corps, United Nations-FAO Watershed Protection Project, Guinea, West Africa, 1986 – 1989. Supervised 10 plant nursery workers, made vegetation maps in multidisciplinary and international teams, worked closely with Guinean counterparts in water development projects, spent three months helping train new volunteers. Forest Ecology Technician, U.S. Forest Service, Siskiyou National Forest, Grants Pass, Oregon, spring/summer 1990 (GS3), Spruce-Fir Community Ecology Project, Colorado State University, Roosevelt National Forest, Colorado, summer/fall 1985, U.S. Forest Service, St. Joe National Forest, Avery, Idaho, summer 1984 (GS5). Collected forest ecology and silvicultural data in remote settings that required camping on site. Worked in teams of 3-5 people. K. Smith, E. Landreaux, H. Steinmann, R. Hayes, A. Keith-Lucas, C. Hayes. 2015. Climate, deer and hogs: Drivers of rapid change in a hickory-dominated maritime forest on St. Catherines Island. Natural Resources (in press). McGranahan, DA, CB Henderson, JS Hill, GM Raicovich, WN Wilson, & CK Smith. 2014. Patch-burning improves forage quality, creates grass-bank in old-field pasture: Results of a demonstration trial. Southeastern Naturalist, 13(2):200-207. McGranahan, DA, GM Raicovich, WN Wilson, CK Smith. 2013. Preliminary evidence that patch burn-grazing creates spatially-heterogeneous habitat structure in old-field grassland. Southeastern Naturalist, 12(3):655-660. K. Smith and D.A. McGrath. 2011. Shellfish deposition by Native Americans: Changes in soil chemistry on a Georgia (USA) barrier island. Journal of Coastal Research, 27(1), 103-109. D. Lemoine, J. Evans, C.K. Smith. 2006. A landscape-level GIS analysis of streamside management zones on the Cumberland Plateau. Journal of Forestry, 104: 125-131. McGrath, D.A. and C.K. Smith. 2006. The Sweet Earth: a Biogeochemistry Perspective on Tropical Deforestation. In: Tropical Deforestation Exploring Environmental Challenges: A Multidisciplinary Approach. S. L. Spray and M. D. Moran (eds), Acada Books. C.K. Smith, M. Coyea, and A. Munson. 2005. The response of fine roots to fertilized ingrowth cores in burned and harvested black spruce ecosystems. Communications in Soil Science and Plant Analysis, 36:1361-1372. McGrath, D.A., J.P. Evans, C.K. Smith, D.G. Haskell, N.W. Pelkey, R.R. Gottfried, C.D. Brockett, M.D. Lane, E. D. Williams. 2004. Mapping land-use change and monitoring the impacts of hardwood-to-pine conversion on the southern Cumberland Plateau in Tennessee. Earth Interactions 8:1-24. C.K. Smith, H.L. Gholz, and F. de Assis Oliveira. 2002. Soil carbon storage and dynamics after forest conversion to plantations in lowland Amazonia, Brazil. Forest Ecology and Management 164: 257-263. McGrath, D., K. Smith, H. Gholz, and F. de Assis Oliveira. 2001. Land use effects on soil nutrient dynamics in Amazonia: A review of previous work. Ecosystems 4: 625-645. C.K. Smith, M. Coyea, and A.D. Munson. 2000. Soil carbon, nitrogen, and phosphorus stocks and dynamics in disturbed black spruce forests. Ecological Applications. 10(3):775-788. K. Smith, A. Munson, M. Coyea, A. Wallstedt, and H. Margolis. 1999. Comparative studies of CPRS (cut with protection of regeneration and soils) and natural disturbance by fire: developing a basis for sustainable practices in black spruce ecosystems. Proc. of the 1999 Sustainable Forest Management Network Conference, Edmonton, Alberta, Feb. 1999. pp. 436-441. C.K. Smith, H.L. Gholz, and F. de Assis Oliveira. 1998. Soil nitrogen dynamics and plant-induced soil changes under plantations and primary forest in lowland Amazonia, Brazil. Plant and Soil. 200:193-204. C.K. Smith, H.L. Gholz, and F. de Assis Oliveira. 1998. Fine litter chemistry, early-stage decay, and nitrogen dynamics under plantations and primary forest in lowland Amazonia. Soil Biology and Biochemistry. 30(14): 2159-2169. C. K. Smith, A.D. Munson, and M.R. Coyea. 1998. Nitrogen and phosphorus release from humus and mineral soil under black spruce forests in central Quebec. Soil Biology and Biochemistry. 30(12): 1491-1500. Ken Smith, Henry L. Gholz, and Francisco de Assis Oliveira. 1998. Litterfall and nitrogen-use efficiency of plantations and primary forest in the eastern Brazilian Amazon. Forest Ecology and Management. 109:209-220. C.K. Smith, T.L. White, G.R. Hodge, M.L. Duryea, and A.J. Long. 1993. Genetic variation in first-year slash pine shoot components and their relationship to mature field performance. Canadian Journal of Forest Research. 23: 1557-1565. C.K. Smith, T.L. White, and G.R. Hodge. 1993. Genetic variation in second-year slash pine shoot traits and their relationship to 5- and 15-year volume in the field. Silvae Genetica. 42: 266-275. Working group report. 2012. Forest Biomass Retention and Harvesting Guidelines for the Southeast. Forest Guild Southeast Biomass Working Group. Forest Guild, Santa Fe, New Mexico. 18 pp. Wilson, N. and K. Smith. 2010. Prescribed fire and oak regeneration. Forest Wisdom #16, Forest Guild, Santa Fe, NM. Smith, K. and S. Rich. 2009. Restoration in New Mexico Watersheds: The Uplands. Southwest Hydrology. 8: 30-32. Institute, Restoration Working Paper 7 (20 pp. ), New Mexico Highlands University, Las Vegas, NM. Smith, K., W. Dunn, M, Zaksek. 2008. Involving Rural Communities in Forest Management: New Mexico’s Collaborative Forest Restoration Program. New Mexico Forest and Watershed Restoration Institute, Restoration Working Paper 4 (10 pp. ), New Mexico Highlands University, Las Vegas, NM. Savage, M. T. Derr, A. Evans, E. Krasilovsky, K. Smith, H. Carey. 2008. Short guide for developing CFRP prescriptions. New Mexico Forest and Watershed Restoration Institute, Working Paper 1 (20 pp. ), New Mexico Highlands University, Las Vegas, NM. Smith, C.K. 2005. Redefining the role of natural resource extraction in forest conservation (book review). BioScience 55:625-626. Burckle, J. and K. Smith. 2003. 2003 Management Plan: Beyond Sewanee’s Central Campus: A Ten-Year Strategic Plan for the Domain. University of the South, Office of Domain Management (34 pp. ), Sewanee, TN. K. Smith, H.D. Davignon, and A.D. Munson. 1997. Report on the Development of Indicators for the Criteria of the Canadian Council of Forest Ministers. The Maintenance and Improvement of Forest Ecosystem Productivity. Quebec Minister of Natural Resources, Quebec City, Canada. C.K. Smith 1996. Book Review of the Literature of Forestry and Agroforestry. P. McDonald and J. Lassoie Eds. Agroforestry Systems.34:221-224. K. Smith. 2014. Forest restoration on the Cumberland Plateau: Ecological success or boondoggle? Invited lecture, University of Tennessee at Chattanooga. K. Smith. 2012. Forest Guild Biomass Harvesting Guidelines for the Southeast US. Short rotation woody crops operations meeting, Oak Ridge, TN. McGrath, D.A. and K. Smith. 2010. Shell middens change soil chemistry on a Georgia (USA) barrier island, 95th Annual Meeting of the Ecological Society of America, Pittsburg, PA.
K. Smith. 2009. Invited lecture: Opportunities to incorporate the ecological values of forests during land use change. University of Florida/IFAS, Hillsborough County, FL. Forests and Climate Change Workshop, and for US Senate and House staffers in Washington, D.C as well as state legislators and committees in Santa Fe. J. Zebrowski, P. Dappen, K. Smith. 2008. Fire History and Forest Fuel Reduction Efforts in the Estancia Basin of New Mexico – Learning from the November 2007 Ojo Peak Fire. 12th Biennial Forest Service Remote Sensing Applications Conference, Salt Lake City, UT. McGrath, D., Smith, K., Gray, M.B., Hinkle, M., Merrill, H., Shaffer, J. 2006. Assessing economic and ecological costs of the exurbanization of forest and farmland at the wildland-urban interface on Tennessee’s southern Cumberland Plateau. 91st Ecological Society of America Conference, Memphis, TN. K. Smith, D. McGrath, M.B. Gray, H. Merrill, M. Hinkle. 2006. The changing face of rural Tennessee: Urban development in farmland and forest. 22nd Annual Conference of the Organization of Wildlife, Land, and Realty Specialists. Chattanooga, TN. K. Smith, D. McGrath, K. Willis, M.B. Grace, M. Hinkle, H. Merrill. 2005. Five acres and a McMansion. Is this the fate or rural farmland and forest in Tennessee? 10th Annual Forest Guild Meeting, Santa Fe. K. Smith, D. McGrath, J. Evans. 2005. Tracking forest change in the Southern Cumberland Plateau. Southern Roundtable on Sustainable Forests. Asheville, NC. K. Smith. 2005. Forest management at Sewanee. Kentucky/Tennessee SAF Annual Summer Meeting, Sewanee, TN. K. Smith. 2004. Environmental performance of uneven-aged approaches contrasted with plantation systems, examples from the Cumberland Plateau. Keeping the Forest 2004. The Pioneer Forest, Salem, Missouri. McGrath, D., K. Smith, J. Kingston, J. Evans, D. Haskell, R. Gottfried. 2003. Mapping Land Use Change and Monitoring Ecological Impact on the Cumberland Plateau in Southern Tennessee. American Geophysical Union, Biogeochemistry sub-group. Santa Fe, New Mexico, June 2003. Smith, K., J. Burckle, E. Ogilvie. 2002. One hundred and four years of forest management at Sewanee. Annual Convention of the Society of American Foresters, Winston-Salem, North Carolina, October 2002. Smith, C. K., A. Munson, and M. Coyea. 2000. Fine root responses to microsite nutrient additions in disturbed black spruce ecosystems. 85th Annual Meeting, Ecological Society of America, Snowbird, Utah, August 2000. McGrath, D., K. Smith, H. Gholz, and F. de Assis Oliveira. 2000. Land use effects on soil nutrient dynamics in Amazonia: A review of previous work. 1st NASA Large-scale Biosphere and Atmosphere Scientific Conference, Belem, Para, Brazil, June 2000. Coyea, M., A. Munson, K. Smith, H. Margolis , and R. Paquin. 2000. Soil CO2 fluxes and temperatures of harvested and fire-origin sites in boreal black spruce ecosystems. The Role of Boreal Forests and Forestry in the Global Carbon Budget, An International Science Conference. Edmonton, Alberta, May 2000. McGrath, D.A., C. K. Smith, H. L. Gholz, F. de Assis Oliveira. 1999. Changes in soil N, P, and Ca cycling after forest conversion to other land uses in the Amazon Basin: A literature review. 84th Annual Meeting of the Ecological Society of America, Spokane, WA. Smith, C.K., Munson, A.D., Coyea, M. 1999. Comparative studies of CPRS and natural disturbance by fire: Developing a basis for sustainable practices in black spruce ecosystems. Canadian Sustainable Forest Management Network Conference, Edmonton, Alberta. Smith, C.K., Munson, A.D., Coyea, M. 1998. Carbon, nitrogen, and phosphorus dynamics under disturbed black spruce ecosystems. 83rd Annual Meeting of the Ecological Society of America, Baltimore, Maryland. Smith, C.K., Munson, A.D., Coyea, M. 1998. Changement des reserves et de la dynamique des nutriments suite aux perturbations naturelles et anthropiques dans les pessieres noires a mousses de la region centrale de Quebec. 66th Meeting of the French-Canadian Association for the Advancement of Science (ACFAS), Quebec City, Canada. Smith, C.K., H.L. Gholz, F. de Assis Oliveira. 1997. Plant-induced changes of forest floor and soil nitrogen dynamics in lowland Amazonia. Ecological Society of America Annual Meeting, Albuquerque, New Mexico. Smith, C.K., Munson, A.D., Coyea, M., Bernier, P. 1997. Nitrogen and phosphorus dynamics under disturbed black spruce forests in Central Quebec. Canadian Centers of Excellence Forest Dynamics Workshop, Calgary, Alberta. Smith, C.K., H.L. Gholtz, F. de Assis Oliveira. 1996. Mechanisms of soil nitrogen transformations under monocultures and native forest in the central Brazilian Amazon. Ecological Society of America Annual Meeting, Providence, Rhode Island. Smith, C.K., H.L. Gholz, F. de Assis Oliveira. 1996. Fine litter nitrogen dynamics under monocultures and primary forest in lowland Amazonia. Soil Science Society of America Annual Meeting, Indianapolis, Indiana.